Last season, Mike & Molly attracted better ratings than the TV series had in its first season. Will that trend continue or will the numbers start to decline? We’ll have to wait and see. 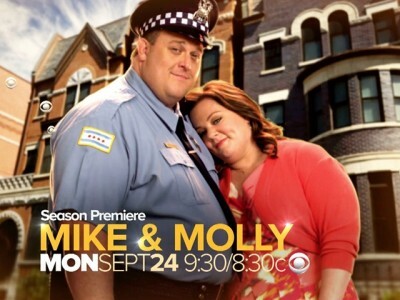 The third season of Mike & Molly typically airs Monday nights at 9:30pm on the CBS network. The cast includes Melissa McCarthy, Billy Gardell, Cleo King, Katy Mixon, Louis Mustillo, Nyambi Nyambi, Reno Wilson, Rondi Reed, and Swoosie Kurtz. Below are the TV show’s ratings for the 2012-13 season, the best way to tell if Mike & Molly is going to be cancelled or renewed for season four. Final season averages: 2.9 rating in the 18-49 demographic with 9.40 million total viewers. 1.9 in the demo (-21% change) with 8.01 million (-4% change). Season averages: 2.86 in the demo with 9.40 million. 2.4 in the demo (+4% change) with 8.31 million (+3% change). Season averages: 2.90 in the demo with 9.46 million. 2.3 in the demo (-4% change) with 8.08 million (-1% change). Season averages: 2.93 in the demo with 9.52 million. 2.4 in the demo (+9% change) with 8.14 million (+5% change). Season averages: 2.96 in the demo with 9.59 million. 2.2 in the demo (-15% change) with 7.76 million (-14% change). Season averages: 2.99 in the demo with 9.66 million. UPDATE: Mike & Molly has been renewed for a fourth season by CBS. 2.6 in the demo (+8% change) with 8.99 million (+7% change). Season averages: 3.03 in the demo with 9.77 million. 2.4 in the demo (-11% change) with 8.38 million (-14% change). Season averages: 3.06 in the demo with 9.82 million. 2.7 in the demo (-16% change) with 9.79 million (-5% change). Season averages: 3.10 in the demo with 9.91 million. 3.2 in the demo (+7% change) with 10.33 million (-2% change). Season averages: 3.13 in the demo with 9.91 million. 3.0 in the demo (-6% change) with 10.50 million (-3% change). Season averages: 3.12 in the demo with 9.88 million. 3.2 in the demo (-3% change) with 10.77 million (-1% change). 3.3 in the demo (-6% change) with 10.89 million (-5% change). Season averages: 3.13 in the demo with 9.76 million. 3.5 in the demo (0% change) with 11.46 million (+12% change). Season averages: 3.11 in the demo with 9.66 million. 3.5 in the demo (+13% change) with 10.22 million (0% change). Season averages: 3.07 in the demo with 9.47 million. 3.1 in the demo (-14% change) with 10.23 million (-9% change). Season averages: 3.02 in the demo with 9.39 million. 3.6 in the demo (+24% change) with 11.29 million (+22% change). Season averages: 3.01 in the demo with 9.29 million. 2.9 in the demo (-3% change) with 9.25 million (0% change). Season averages: 2.93 in the demo with 9.00 million. 3.0 in the demo (+7% change) with 9.24 million (+5% change). Season averages: 2.93 in the demo with 8.96 million. 2.8 in the demo (-7% change) with 8.78 million (-4% change). Season averages: 2.92 in the demo with 8.90 million. 3.0 in the demo (+7% change) with 9.10 million (+5% change). Season averages: 2.95 in the demo with 8.93 million. 2.8 in the demo (-3% change) with 8.67 million (+2% change). Season averages: 2.93 in the demo with 8.88 million. 2.9 in the demo (-7% change) with 8.52 million (-10% change). Season averages: 3.00 in the demo with 8.98 million. 3.1 rating in the 18-49 demographic with 9.45 million total viewers. Season averages: 3.10 in the demo with 9.45 million. Year-to-year, the sitcom was down by 35% in the demo (vs a 4.8 rating) and 32% in viewers (vs 13.86 million) but last season’s opener had the advantage of airing out of the second Ashton Kutcher episode of Two and a Half Men. Reference point: The 2011-12 season averaged a 3.4 rating in the 18-49 demographic and 11.05 million viewers. What do you think? Do you like the Mike & Molly TV series? Do you think it should be cancelled or renewed for a fourth season? Yes leave the show on! I’ve laughed til tears ran down my face! Love it! Please renew M&M, I look forward to watching it. I would love to see them get healthy together. This is a really cute show and much better than “Two Broke Girls” ..please keep it on. Mike & Molly is one of my favorite shows! I looked forward to it every week and I know of many others who do as well. How can CBS even think of cancelling it? I am extremely disappointed. Please renew. my wife and I thoroughly enjoy watching M&M on Monday nights. Renew. Cancel. All the crappy reality shows!!! RENEW!!!!! RENEW!!!! It gets better and better. It’s a recorded series on our TV. I even watch reruns! Awesome show with character unique. Please, please, please bring back this show. I really find this show really funny, there is not an eposide that I do not laugh through. This show hits home as by husband is a retired Chicago Police Office and both of my boys are on the force. Please bring this back as watching this show is like my family.